Sun embodies life on earth. We owe our very existence to the light and energy from Sun. Surya Graha (Sun) exerts a powerful force on the course of life by its placement in Janma Kundali (Horoscope), as his influence reverberates across all the nine planets. The malefic effects of Sun in horoscope could cause several problems that hamper the growth. 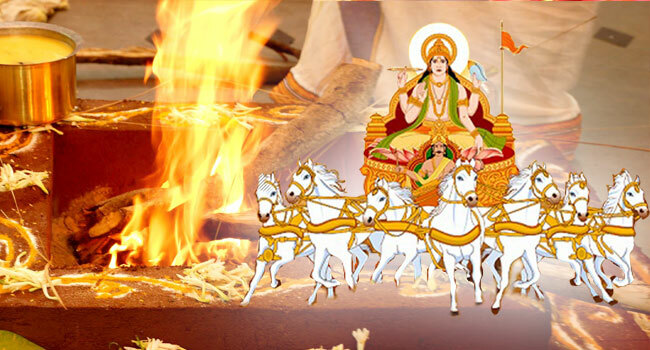 Surya homa primarily focuses on pacifying Sun and reduce complications. It plays a key role in overcoming several problems in life by meeting exact requirements. By clicking on the 'Book Now' button, you agree to our Terms & Conditions. 1.The Seva charges will not be refunded under any circumstances.2.Devotees availing themselves of various Sevas should strictly adhere to tradition and regulations3.Receipt issued against any payment should be produced at the time of availing the Seva. The Seva charges should be invariably remitted at the Seva counter or through the authentic online services (Mobile App / Website) and receipt should be obtained.4.In the absence of devotees, who have registered their names for any particular Seva, the Sri Mutt will complete the desired Seva in the name of respective devotee.5.Donations and other offerings pledged for Sri Gururajaru should be promptly submitted at the official counter and obtain a proper receipt for all the items.6. Donations offered to Sri Gururajaru should be compulsorily put into the Hundi or remitted through the authentic online services (Mobile App / Website) and receipt should be obtained.7.Devotees availing Sevas are requested to be present at the Mutt at the specified time. 8.Children of all ages will be taken into account.9.During the performance of the puja and at the time of having food, the male devotees should compulsorily wear seva vastras.10.The Seva receipt should be produced at the time of the performance of Seva and while receiving Tirtha and Prasada, including meals.11.Table and chairs will not be arranged for consumption of Tirtha and Prasada. Cups and glasses for drinking water should be brought by the devotees themselves.